At the end of the seventh month of pregnancy, fat begins to be deposited on your baby. Your baby is about 36 cm (14 inches) long and weighs from about 900 - 1800g (two to four pounds). Your baby's hearing is fully developed and he or she changes position frequently and responds to stimuli, including sound, pain, and light. If born prematurely, your baby would probably survive after the seventh month of pregnancy. Your baby, who is now about 46cm (18 inches) long and weighs as much as about 2.27 kg (five pounds), will continue to mature and develop body fat reserves. You may notice that your baby is kicking more. 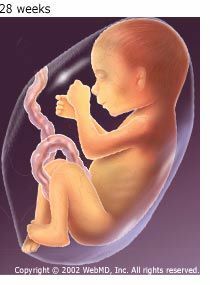 Baby's brain is developing rapidly at this time, and he or she can see and hear. Most internal systems are well developed, but the lungs may still be immature. 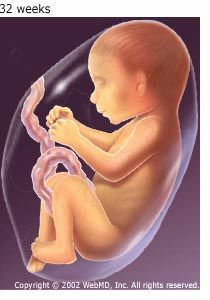 Towards the end of the third trimester, your baby continues to grow and mature. His or her lungs are nearly fully developed. Your baby's reflexes are coordinated so he or she can blink, close the eyes, turn the head, grasp firmly, and respond to sounds, light, and touch. Your baby's position changes to prepare itself for labor and delivery. The baby drops down in your pelvis, and usually his or her head is facing down toward the birth canal. 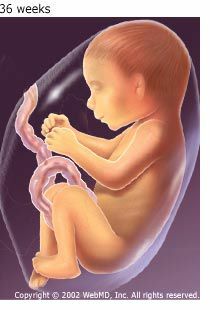 By the end of this pregnancy month, your baby is about 46- 51cm (18 to 20 inches) long and weighs about 3.2kg (seven pounds).